I knew the Vietnam War could not last much longer when I saw news photos of members of Vietnam Veterans Against the War hurl their combat medals back onto the Capitol grounds. By then the VVAW's ranks included many soldiers still on active duty. In Vietnam, some American soldiers even sewed the VVAW patch to their uniforms. "What are they going to do to me?" asked one of them. "Send me to Vietnam?" (NWN # 15). Our soldiers' rebellion against a b.s. 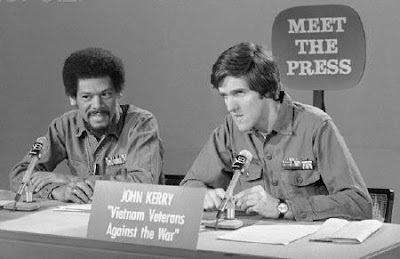 war also took forms that received less publicity than the VVAW: more than a half-million desertions; sabotage, GI-produced underground newspapers, rampant drug use, and much more "fragging" than we were led to believe. Fragging was the killing by enlisted men of their gung-ho or reckless junior officers (following two or three more subtle notices that a change in attitude was recommended). 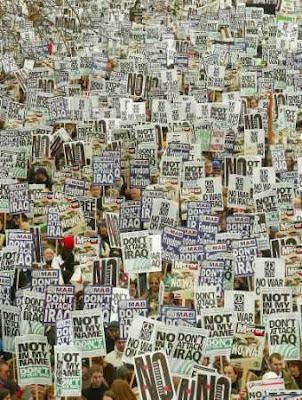 As we saw in the run-up to the Afghanistan invasion, the run-up to the Iraq war, and now the run-up to the Iran War, the ruling elite now feels entirely comfortable in ignoring massive protests by civilian citizens against its policies. And ignoring clear mandates from the voting booths (2006 and 2008). Rebelling soldiers are harder to ignore. And rebelling officers might even get some news coverage! Meanwhile, back at the kibbutz . . . In Israel, conscription is close to universal for citizens of both sexes, and the Israel Defense Forces (IDF)--the military--is held in very high regard by citizens. Yet even here, many soldiers, sailors, and airmen--including many officers--refuse to participate in the occupation, colonization, and ethnic cleansing of Palestine that has been underway without pause for many decades. Some have their wish granted. With a wink and a nod from their commander, they are.assigned to serve only within Israel's 1967 borders. And some are thrown in jail. All are called, and call themselves, "Refusers." 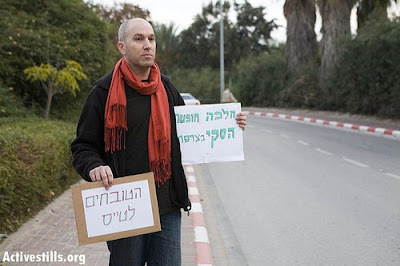 They are supported by several Israeli organizations including Yesh G'vul ("There Is a Limit"), New Profile, Courage to Refuse, and Combatants for Peace. 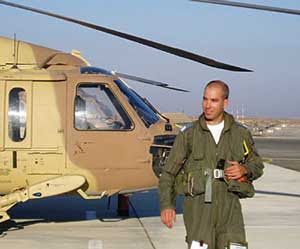 Major Yonatan Shapira is a Jew, a patriotic Israeli, the child of a career-military family, and an IDF helicopter pilot (now retired). In this week's installment he tells the fascinating story of his slow transformation into a Refuser. Although he has no love for Hamas, he slowly came to understand why some members might become terrorists. He began to see that, in Palestine, his beloved IDF was failing to abide by its own professed principles. And he came to see that the Palestinian Resistance and Israel were, together, perpetuating a "circle of revenge" that was destroying both sides. As he memorably says, "I was going to the Air Force course in order to become a pilot in the Israel Defense Forces . . . not the Israel Revenge Forces." 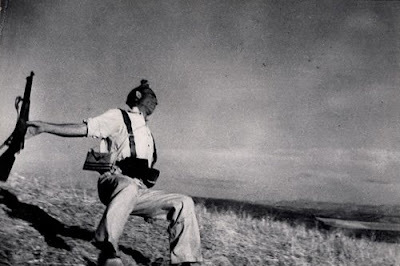 He was pleased to discover that many of his fellow IDF pilots, and some of their commanders, saw things as he did. This talk shows the transformation of an unthinking warrior into a citizen-soldier ready to defend his country . . . only. It also reveals many interesting details about warfare in the 21st century. Memorial Day is Monday, May 25, and this week's show commemorates it. 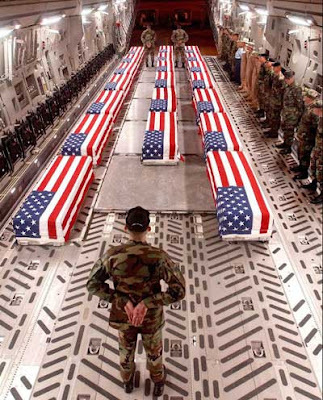 Just as the wrong sorts of people wave the flag, for all the wrong reasons--so the same people do their best to turn Memorial Day into a celebration of military service, unnecessary wars, belligerent foreign policies, and obscenely high and ever-increasing expenditures for quote-national defense-unquote. Personally, I prefer Christmas--the only national holiday in which the word "peace" is ever uttered, however insincerely. And don't even get me started on Armistice Day! Originally a multinational holiday celebrating the end of the most gawdawful war in history, to that date. Now transformed into "Veterans Day" by our patriotic, peace-loving Congress. Quite a metamorphosis, eh? This week, New World Notes offers an Alternative Memorial Day Celebration. The full title is, The Slippery Slope of Memorial Day. First I elaborate on the main theme. To remember those whom the State caused to die is worthy. To celebrate a foreign policy consisting mainly of armed belligerance is unworthy. To call for ever more deaths and ever more killing so that "these honored dead shall not have died in vain" is obscene--the bottom of the slippery slope. Guess where most conventional Memorial Day celebrations end up. Then we hear veteran Middle-East correspondent Robert Fisk sharing his own thoughts on war. Finally I'll read Howard Zinn's fine 1976 column on war and Memorial Day. 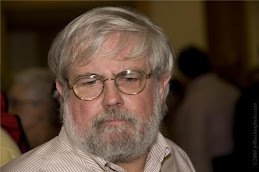 At the time, he was a columnist for the Boston Globe. The day afterwards, he was no longer a columnist for the Boston Globe. Well--to invert T.S. Eliot--at least he went out with a bang, not a whimper! Zinn's essay both begins and ends with a few words about drunken smashups. At the end, though, he's talking about more than just highway accidents. Clever. Sensational revelations in the 1970s focused on the project's use of LSD on unwitting subjects. This caught viewers' attention, but LSD was just the tip of the iceberg. 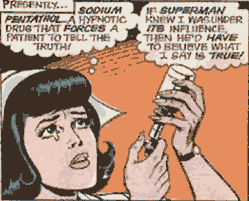 The MK-ULTRA experiments used a wide variety of powerful and sometimes antagonistic drugs in attempts to erase the contents of the subject's mind so that new content could be implanted. They used large and repeated doses of electroshock to complement the drug cocktails. To this they often added long periods of sensory deprivation. None of the subjects of the experiments had consented--or were even aware that they were being used as guinea pigs. 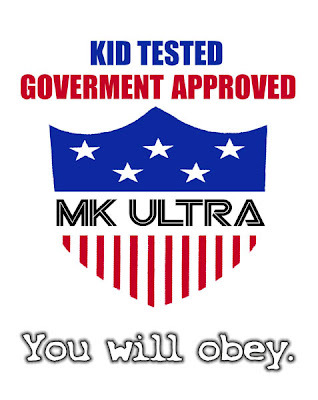 An early public justification of MK-ULTRA--when the project finally was exposed--was that it sought to understand "brainwashing" or "mind-control" techniques supposedly employed by the enemy in the Korean War. More recent statements by intelligence officials suggest that the main focus was on developing new and more effective methods of torture to extract information from "enemies." In recent years, the Bush-Cheney stooges who tortured detainees in Abu Ghraib, Guantanamo, Bagram, and elsewhere followed the MK-ULTRA playbook to the letter. 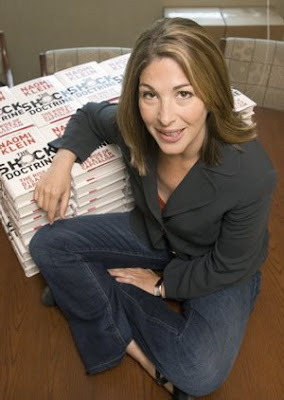 In a chapter of The Shock Doctrine (2007), Canadian journalist Naomi Klein tells the story of Gail Kastner. 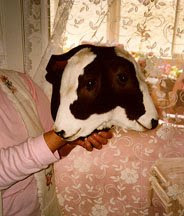 In the 1950s Gail had been an unwitting guinea pig in MK-ULTRA experiments performed on her in Montreal by Dr. (Donald) Ewen Cameron--an American, one of the continent's most distinguished psychiatrists. The experiments--involving bizarre drug cocktails, sensory deprivation, and massive doses of electroshock--failed to erase her mind. However, they did induce schizophrenia ("with hysterical tendencies") and also permanent amnesia of her life from birth through the time of her "treatment" (early 1950s). They permanently damaged her mind, to this day. 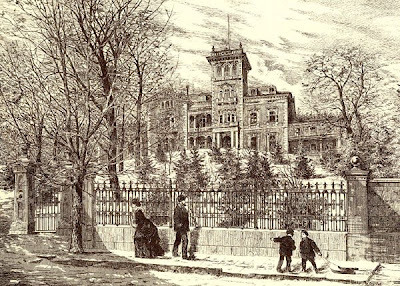 Gail, then a nursing student, had gone to Cameron seeking treatment for anxiety. In this episode of New World Notes, Klein reads aloud--and very well--most of her chapter on Kastner, Cameron, and MK-ULTRA. It's a scary story that leaves you wondering: If they'd do this, what else are they capable of? And they did such things starting in the administration of one of the 20th century's sanest and least warlike U.S. presidents, Dwight Eisenhower. 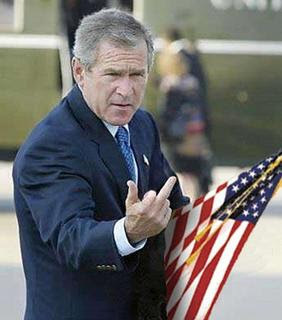 What did they do under maniacs like Bush-Cheney?? Ewen Cameron and other CIA-funded medical researchers. I chose the song because of its theme--the American government's habit of making the same mistakes over and over again. Later it dawned to me that my choice of song might be seen as mocking the memory loss that Kastner and other victims of MK-ULTRA had experienced. No such mockery is intended. reactor #2 are on the left. All graphics: Click to enlarge. Years ending in "9" tend to invite disasters involving big energy suppliers. 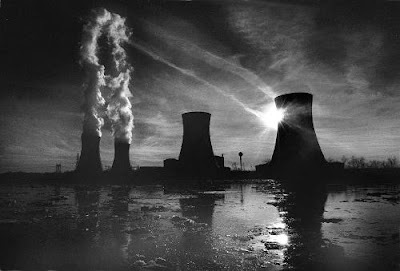 In 1979, Pennsylvania almost became the first Chernobyl, when Reactor Unit 2 at the Three Mile Island [TMI] nuclear power plant suffered a not-far-from-total meltdown. The plant--on the placid Susquehanna River just south of Harrisburg--was within 100 miles of Washington DC, Philadelphia, and Baltimore. far too late) alongside, to the left; and southbound oil slick. 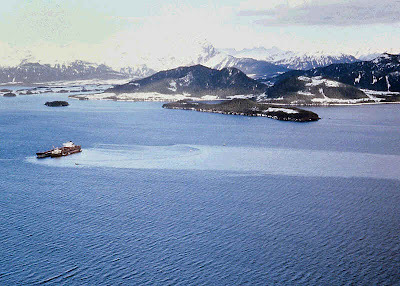 In 1989, Exxon Corp. hosted the world's most damaging oil spill when the tanker Exxon Valdez smashed into a reef off the coast of Alaska. The drunken captain was blamed, but at the time, the Third Mate had command of the ship. The real culprits were (surprise!) 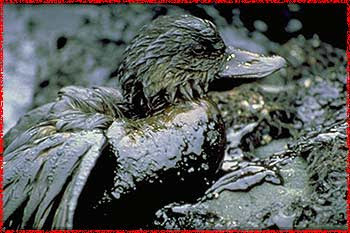 Exxon and partner BP, which were illegally operating the ship without millions of dollars of required safety equipment. In 1999, Exxon and Mobil were allowed to merge, thus creating the largest corporation in the world and thus essentially reconstituting John D. Rockefeller's Standard Oil Company. Republican President Theodore Roosevelt had broken Standard Oil into a couple dozen pieces, on the grounds that a corporation that huge--that close to a monopoly--was a threat to democracy and capitalism both! The GOP has taken to calling itself "The Party of Ideas." Hard as it may be to believe, a century ago, not all of its ideas were bad ones! Also in 1999, a (Phillips) refinery in Texas blew up. I can't wait to see what 2009 will bring! My fearless prediction: A reborn, non-union General Motors will introduce its greatest sales sucess ever, the Hummer H-6. So named because it's the size of the H-1, -2, and -3 combined. Its award-winning advertising slogan will be, "When some f***ing Mexican immigrant gets drunk, steals a car, and smashes into you head-on, . . . what do you want to be driving?" This week, New World Notes examines the first two disasters. We discover (surprise again!) a tissue of corporate irresponsibility, human and environmental destruction, lack of punishment for the guilty, and lying governments more interested in protecting corporate profits than the lives of their citizens. 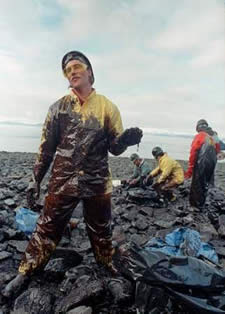 Greg Palast explains the scandals that underlie the Exxon Valdez disaster. I read an article by Harvey Wasserman that explains the scandals attending--and the unreported casualties of--the TMI meltdown. And Roy Zimmerman restores our pride in American capitalism with a song, "Multinational Anthem." Well, he tries to. Sort of. (along right edge of graphic). What the heck?? In the radio show I neglected to give credit where due. America's exciting Three Mile Island adventure was brought to us by designers Babcock & Wilcox ... the owner-operators, the Metropolitan Edison unit of General Public Utilities ... and government and state agencies too numerous to mention. 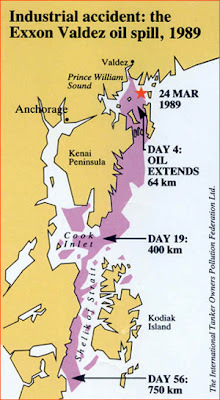 There's little chance of hiding the identity of the main culprit when smashed tankers carry names like Exxon Valdez. Rumor has it that Exxon-Mobil Corporation has adopted a new naming policy. Company tankers that ply dangerous waters are being renamed the Government Interference Valdez, the Excessive Corporate Taxation, and the Barack Obama Socialism. Future smashups should generate less unfavorable publicity for the company! 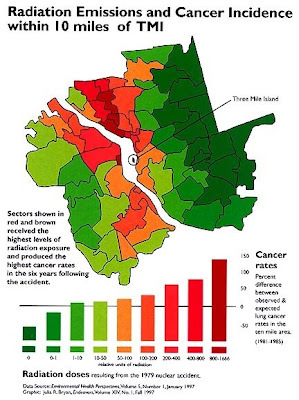 radiation releases from the TMI accident were insignificant. need to be a weatherman to know which way the wind blows! Especially interesting is its argument that on 9-11, hijacked UAL Flight 93 was heading to TMI, where highly contaminated Unit 2 was sealed and Unit 1 was still in operation. Flight 93 crashed in southwestern Pennsylvania, heading towards TMI and, beyond that, Washington, DC. 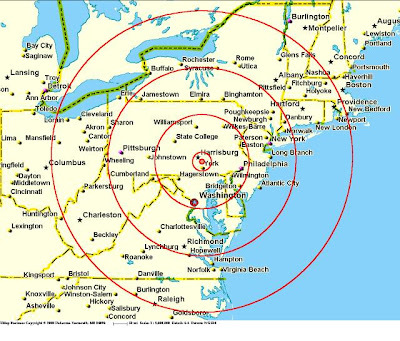 If DC was its destination, it was flying at unusually low altitude as it approached Shanksville. Was it aiming for something closer than the White House? Had the Boeing 747 smashed into TMI, a Chernobyl-sized disaster could very well have ensued. Incidentally, I can assure you that the "containment vessels" of every nuclear power plant in the United States today are more than strong enough to withstand a 65-mph direct hit by any fuel-laden Piper Cub in the sky. So you can sleep peacefully! Indian Point blows. That's 25 miles north of NYC. Can you say Helter Skelter?